This entry was posted on March 8, 2010 at 9:13 pm and is filed under english. You can follow any responses to this entry through the RSS 2.0 feed. You can leave a response, or trackback from your own site. You might like to fix URL for the video, guys 🙂 And… Great work indeed! thanks for the warn. fixed. hey, i’ve seen this application before. isn’t chordata a copy from this one (5 years old, by the way)? Which one? I guess you refer to CLAM Music Annotator. If so, yes, Chordata reuses components of that application. 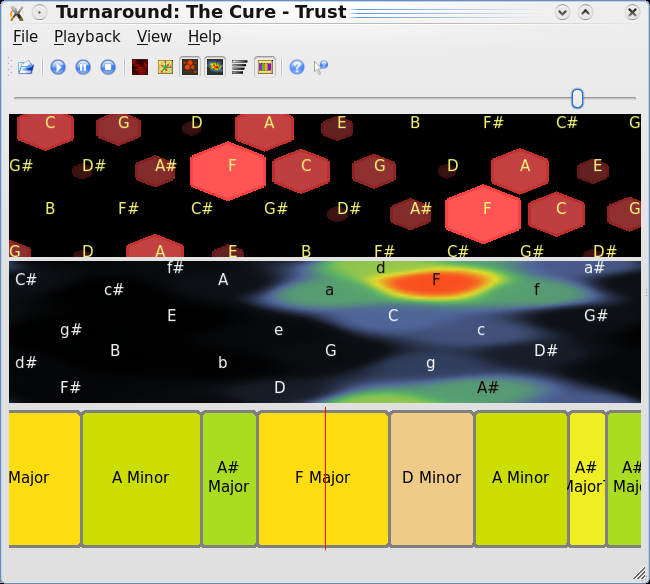 CLAM Annotator was focused in a very different purpose (metadata annotation, and inspection of music information retrieval algorithms results) and was just too complex to use for the purpose of just exploring chords. That’s why we developed Chordata. Chordata adds ease of usage, more views and enhanced navigation within the song. Annotator provides the flexibility of changing and combining different algorithms and data sets, this complexity is hidden in Chordata, just the chords. Download link for OSX? Your downloads only have SMS, Annotator, and Network apps, not Chordata. @picatost: Oh yes, now i saw the video (i have flash disabled at home). That application was developed by the UPF/MTG as CLAM. Authors of that application (Jordi Bonada and Emilia Gomez) contributed the KeySpace view to CLAM as noted in the about dialog. The algorithm is similar to Emilia’s one but different, and was contributed by QMUL, Emilia has suggested me many times to incorporate her algorithm as an alternative and it is feasible but we are always short in time. This would be a nice GSoC project. @Zed: No updated OSX binaries sorry. We are waiting for anyone to contribute them as we do not have a OSX box right now to build them. Indeed, as someone noted in the devel list the release had the build system broken for Mac. If you want to help, please join the list. I downloaded and installed Chordata 1.0.0 for Windows. After analyzing an mp3 file, the song would not play. I am using Windows 7 Home edition (32 bit) if that helps any. Any plans to make the whole framework compatible with xerces-c-3? It’s been released more than 18 months ago. Worst case, maybe bundle xerces-c-2 and link statically? Can’t give chordata nor libclam a try without that. isnt chordata compatibe wid win xp?? @Ave: we didn’t tested it on Windows 7. If you can provide us more information about the error maybe we can guess what is the problem. Can you describe exactly what happens? The program crashes, or just doesn’t sound? La idea del programa me parece muy buena, pero no entiendo muy bien. ¿Aparte de los hexágonos de colores el programa escribe la partitura? En los pantallazos no se ve nada que apunte a eso, y la verdad es que con todo en la lengua del imperio, pues me he perdido un poco, jeje. @Patrice: David -a.k.a. vokimon- yesterday did the migration to xerces-c-3. Thanks David! I’m only just installed Ubuntu Lucid on my computer; and am still new at all this apt-getting. Can you give me a quick step-by-step on getting Chordata installed? Very nice guide. Thanks for sharing. Someone please build a Mac binary… I’ve been trying to do it for several hours now and have been running into many issues with QT4 and LD. Anyone let me in on the big secret how you actually download this? Id love to give it a try and report back. SOunds a great project. Hola, Es posible volcar el output de chordata a un archivo de texto?. Desde de hay tal ves sea posible aplicar algun algorithmo para convertir ese texto en midi. To get the chords in a file: Use the extractor that comes with Annotator. Mac: No Mac box is available to any developer to compile CLAM at. Actually there is no packages for Linux64bits systems. Is there a way to compile from source, or are you planning to make a Maverick 64bits package ? Very nice job, this soft is great! Is there a easy way to test Chordata on Ubuntu 10.04 or a very detailed guide for assholes users ? install clam-chordata? but not sound. JACK ERROR: server not running? Please, get support at the clam-user mailing list or in the clam forum. And. please, specify details such as the distro you are using. And some translation of the russian comments so we could help. wat result does clam chordata give?? i wantd tempo, octave,pitch,root,mood values for a music track… hw cn i find it? help..